Infiniti G Pros and Cons | Page 1 of 7 | Why Not This Car? What drives people to buy (or not buy) a certain car? 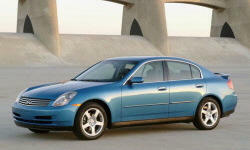 TrueDelta's members share Infiniti G pros and cons based on their real-world driving experiences. 2010 G37 Journey Sedan is awesome! Incredible performance. 0-60 times in mid 5 seconds. Lot of torgue. Gas mileage could be better. AWD model is awesome in snow! Infiniti G37 great performance and value in a nice sporty sedan. Great as a daily driver, it provides a good balance between luxury and performance, especially at its price. The G force. Acceleration is top of the class. Handling is praiseworthy, it can handle curves with aggression and precision, yet remains smooth and controlled when the road is not. I have some small gripes about what I feel is bad design, but overall I love this car and I don't regret the purchase at all. I fully intend to keep this car until the wheels fall off. I absolutely love the looks of this car, this was one of the main reasons why I bought it. Every time I walk out to my car I smile. I liked the acceleration and hoped the car would be more satisfying to drive, but 2 weeks after buying regretted it. Unexpectedly quick and fast. Would have been rated at over 360 hp back in the muscle-car era, and weighing 500 less pounds. Pulls very strongly all the way up to its lofty 7,200 rpm redline. Great throaty song too. Should please the enthusiast family man. It looks sporty and sleek, but I could do without the upward flair of the fenders. Very tight handling, feels very sporty, takes corners on rails, feels like you are going 20 mph even at high speeds. Beautifully done, excellent center display and console controls. Mine has the wood trim and I could look at it all day. Owners spend 95% of their time looking at their interior and dash and only 5% looking at their exteriors. This car will satisfy! Very fast, high torque throughout the range. You cannot shift as well as this 7 speed auto, so manual mode is all but irrelevant. Wide power band in the mid to high range, always feels like the car wants to go faster and has more to give at any speed. Great exhaust note, sometimes the thrill of accelerating is more about the sound than anything else. Required a great deal of flexibility to get into the back then the lack of any headroom caused me to sit at an angle. Very few friends willing to ride in the back for any time at all. It has aggressive styling that hints at the raw power of this sedan. The 2010 has moved the front fogs to a more traditional location which balances the front. Smooth as silk power and loads of it--more than anyone really needs for daily driving and more than enough to always bring a smile to your face. 3+ years and has been very dependable.